Perfect Downtown Location - 30 Night Minimum - Large Balcony with a View! NOTE: Please Be Sure to Set the Regional Rate Settings at the Top of Your Screen to Your Local Currency. VRBO Automatically Defaults to USD Funds. Please Note: You Will Still Be Charged in the Owner's Canadian (CAD) Currency. Thank You! Welcome to the Heritage View Suite, which is located in the newly-converted steel and concrete Abacus Building, in Victoria’s historic Old Town district. It is close to the site of the original Johnson Street Bridge (the Blue Bridge) which was designed by Joseph Strauss, who also designed San Francisco’s Golden Gate Bridge. Conveniently located in the heart of downtown Victoria, a short 6 minute walk to Victoria’s world-famous Inner Harbour. Many convenient services and amenities are at your fingertips, such as banks, restaurants (Mole, Shizen, Brasserie L'Ecole, Olo, Jam) coffee shops (Habit, Bean Around the World, Union Pacific), bakeries (La Tana, Willie's), transportation, convenience stores, theatres (McPherson Playhouse), etc.... This truly is the "perfect location". 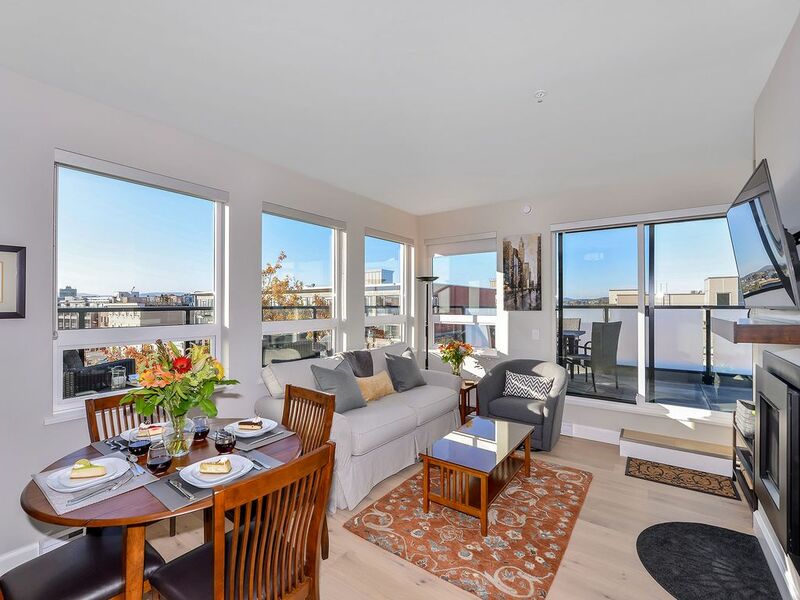 The Heritage View Suite is a large two bedroom two bath apartment style condo, bright and spacious, offering a peek-a-boo view of the Inner Harbour and surrounding skyline. The dining area offers seating for four or curl up with a book on your comfy couch in front of the gas fireplace. There is a lovely desk with drawers / work space area to catch up on emails and journals from home. Your fully equipped kitchen offers brand new Bosch appliances as well as a gas stove, a rare find in downtown apartments. Oversize Bosch washer and dryer are located in suite in a large laundry closet. Your suite is equipped with granite countertops throughout, including both baths. The ensuite and main bath are equipped with tub/shower combination. The Heritage View Suite boasts a large L shaped patio, with dining table for four, as well as casual seating for four. Relax and enjoy the sunset and views of the Inner Harbour from the comfort of your private west side patio. The Heritage View Suite has been tastefully furnished and equipped, so that you can enjoy this self-catering “home away from home” during your visit to British Columbia’s Capital City. *Starter supply of paper goods, trash bags, foil, plastic wrap, hand soap, laundry detergent, dish soap, herbs & spices, coffee, tea & more! We have supplied the Heritage View Suite with starter cleaning supplies, dishwasher & laundry pods, pantry items (coffee, tea, sugar, cereal, etc...) and a welcome package upon your arrival. It is our aim to provide you with great service and accommodations, so please don’t hesitate to contact us at any time should you have any questions or require any additional information. We have tried our very best to ensure that's what you'll find when you stay in our comfortable and convenient Heritage View Suite in downtown Victoria. Rod and Melissa, our wonderful vacation rental agents at City Life Suites, Victoria, will be glad to assist you with your reservation and will be glad to answer any questions you may have. The location, without question, is the best of just about any place you'll find anywhere in downtown Victoria. The apartment is brand new, high end appliances, oversized washer and dryer, gas stove and gas fireplace, which is rarely found in downtown apartments, and a large L shaped balcony, with dining table for four, casual seating, and plenty of room for storage. The Heritage View Suite comes with one reserved parking stall, and secure bike storage. In addition, you will have access to the on site fitness and amenities room. As our guests, you will always be greeted in person when you check in, so that we can familiarize you with your apartment, building and surroundings. We hope you feel welcome and that you settle in comfortably. We provide milk, bread, fruit, coffee, tea, jam & butter so that you have the fixin's for breakfast on your first morning. Located in the heart of Old Town, steps away from Canada's oldest Chinatown, where restaurants, cafes, bakeries, pubs, bookstores, museums, theatres and more and steps away. No need for a car! Only 2 blocks from Wharf Street / Store Street, the famous Inner Harbour is less than 1 km away. Experience a nautical ambiance during your stay at the Heritage View Suite! Beautiful Inner Harbour View from your living room, relax and take in the view! Land line with two receivers, local and unlimited long distance in North America included in rate. Electric baseboard heating, as well as a gas fireplace located in the living room. High end linens provided, along with mattress encasements, mattress covers, pillow protectors, duvet and duvet covers. Oversized In Suite Bosch washer and dryer. Enjoy the warmth of your gas fireplace during the winter months. One reserved parking stall in the secure gated underground parking, included in your rate. Secure gated underground parking, included in your rate. High Speed wireless internet / Secure designated network & password included in rate. High end bath, hand and face towels provided. Fitness room access for residents and guests of the Abacus. Two elevators from lobby - Secure access to all floors. Sun filled living room with an Inner Harbour View, seating for 4. Access to large L shaped patio from living room. Bosch whisper quiet full size dishwasher. Bosch full sized stainless steel double door refrigerator with bottom double drawer freezer. Bosch Gas Stove / Oven stainless steel. Bosch full size stainless steel microwave. Drip coffee maker, as well as Keurig. Full spice rack included, salt, pepper, coffee beans, grinder, tea, sugar, and many other amenities you rarely find in other vacation rental apartments. 47" Smart HDTV, with premium Shaw cable package for your viewing pleasure. Shaw cable package for your viewing pleasure. Generous library of books in suite. Large L shaped patio boasts view of the Inner Harbour, hills of Vic West and city landscapes. Ample seating, the Heritage View Suite has a dining table with seating for 4 and casual seating for 4. We thoroughly enjoyed our 5 month stay at the Heritage Suite. The suite itself is modern and nicely furnished with all the amenities you could need. The patio is very large for a condo and offers a beautiful ocean view. The location is great for shopping, restaurants, and being close to the water. The condo managers, Melissa and Rod, were exceptionally attentive and helpful. Overall a wonderful stay, only wish we could have stayed longer. Thank you so much for taking the time to write your review! Nothing makes us happier that to hear you enjoyed your stay with us in the Heritage View Suite. We are so glad you liked the furnishings and extra touches we provide, and we agree, the location can't be beat! Especially that view! Again, thank you for your kind words. We hope to see you again! Sincerely, Rod & Melissa. We look forward to meeting you on your next trip to Victoria, where we will personally meet you to check you into your suite! All reservations are required to complete a City Life Suites Ltd. Rental Agreement.